"What if . . . we got lost far, far, far away, and couldn't find our way home? Then we would become the bravest explorers in the world." So begin the adventures of two intrepid polar bears. Traveling on a ship imagined from an iceberg, the bears encounter magnificent sights and scary situations. When a city made of crayons melts, the bears use pencils to create a beautiful gray world. When all the words in the universe disappear, the bears invent their own language. When something really big and really scary happens, they whistle and hold hands until it's not as big or scary anymore. And when they find their way back home, they're ready to imagine a thousand more possibilities. This companion title to the Boston Globe-Horn Book Honor Book One Day, The End. is ultimately a book about imagination, friendship, and finding possibilities in the smallest moments. 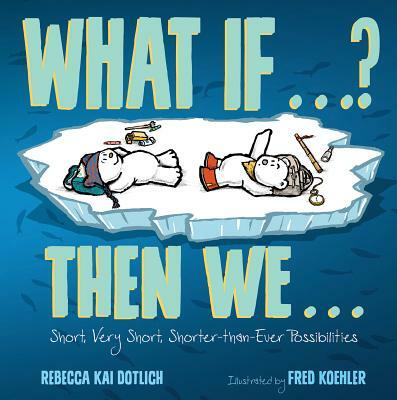 Rebecca Kai Dotlich is the author of many children's poetry and picture books, including One Day, The End; The Knowing Book; and Lemonade Sun. Her books have won various honors, including the Boston Globe-Horn Book Honor Award and the Golden Kite Honor Award. She lives near Indianapolis and gives presentations and workshops across the country. Visit her at rebeccakaidotlich.com. Fred Koehler is the author and illustrator of How to Cheer Up Dad and Super Jumbo. He is the illustrator of One Day, The End, which won a Boston Globe-Horn Book Honor Award; Flashlight Night; Puppy, Puppy, Puppy; and This Book is NOT About Dragons. He lives with his family in Lakeland, Florida. Visit him at ilikefred.com.